Chilean international midfielder Marco Medel had recently picked up what could very well be one of the fastest injuries for a substitute in the history of football. 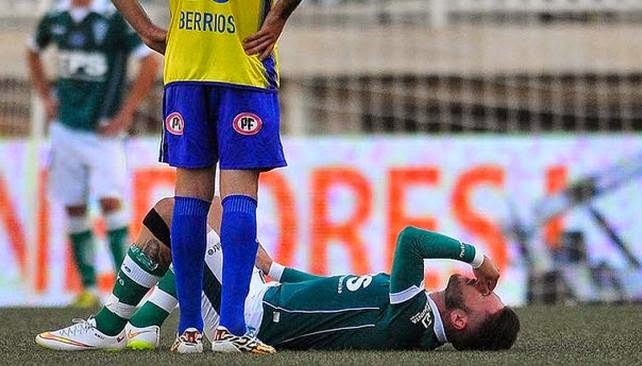 Last weekend, during a Chilean Primera league match between Medel's club Santiago Wanderers and visitors Universidad de Concepcion Marco Medel was called to substitute teammate Pablo Tamburrini in the 55th minute. But as he ran onto the pitch, looking to become the fresh addition his club needed with the score deadlocked at 0-0 Medel was almost immediately seen cringing, looking at his leg and the team's bench. After a few more seconds he began to hobble and eventually sat on the pitch asking to get substituted himself. When Medel motioned to his coach that he needs to come off he had been on the pitch for just 44 second; a mere 8 seconds after that he was on the ground. The Match finished in a 0-0 draw.